For planned operations of our locomotive, see our Hungarian news page where these are listed with expected dates and routes. All interested visitors are welcome to join us during the event. October, 2018  This year, our foundation received more than 2.7 million HUF (ca. EUR 8,400) worth of income tax donations. We would like to thank the domestic taxpayers for this outstanding contribution to our work. May, 2018  We will soon run the year's first excursion train. This time, we planned a round-trip through the hills of Somogy county, and along the south shore of Lake Balaton. Our train will run on May 26, 2018, on the route Budapest  Balatonszentgyörgy  Somogyszob  Kaposvár  Fonyód  Budapest. One of the highlights of the journey will be the visit of line 37 (from Balatonszentgyörgy to Somogyszob) which has not served scheduled passenger traffic since 2009. May, 2017  As announced recently in our Facebook group, our next trip will take place on May 13, 2017. This time, our train will depart from Rákosrendezõ, and will stop at several stations within Budapest (Kõbánya felsõ, Ferencváros, Kelenföld) for boarding. Leaving Budapest, the trip will continue via Székesfehérvár to the intact section of line 6 to Lovasberény. On the way back, we will also visit the industrial siding at Háros. December, 2016  Many railway enthusiasts in Hungary and abroad have followed the transfer of former SNCB 5201 with great interest. The transfer of the unit from Belgium to Hungary gave rise to much rumor about the purpose and the buyer of the locomotive. In the early afternoon of December 5, 2016, the locomotive of our foundation will transport 5201 on the last leg of its transfer to the shed at Budapest-Keleti, and on this occasion, we can confirm: it is our group who has purchased the machine, to serve as a parts supply, mainly for the rebuilding of Di3.623. Our newcomer was sidelined in Belgium several years ago, but its components sustained no serious damage save for a number of stolen cables and some corrosion due to open-air storage, making it a valuable and nearly complete parts supply. The arrival of the unit in Budapest is the conclusion of a long and tiresome procedurethe purchase of a parts supply unit has been, in fact, on our agenda for quite some time. Initially, we actually planned to buy 5401, and conducted negotiations and carried out a number of on-site inspections since early 2013. Unfortunately, repeated administrative difficulties brought delays of weeks or months each timemeanwhile, 5401 sustained so much damage in open-air storage that we had to switch to another unit, namely, 5201. Many have supported our endeavor by connecting us to the right contacts, finding solutions in tangled paperwork or supporting us financially. We are particularly grateful for the help of our faithful supporter NOHAB-Pappi Klaus Korbacherhe has trusted in the success of our undertaking since its very beginnings, and gave us substantial financial support. As we decided to purchase a parts supply unit in 2013, we had the rebuilding of M61-002 in mind. In the meantime, another important challenge came our way which is just as demanding: the complete technical restoration of former demonstrator Di3.623. This gives 5201 a new purpose, as it will donate most of its components to 623 instead of 002. This does not mean that we give up on 002 entirely, but its rebuilding has to be put off for later, given our limited resources. The arrival of 5201 is one of the highlights of an unusually busy year, and it is certain to have much impact on our future work. The restoration of former demonstrator Di3.623 will be a demanding undertaking, yet, having a parts supply unit at hand, we can now have confidence that our efforts will reach their goal. August, 2016  Many have sadly missed the NOHAB-hauled passenger trains to Lake Balaton that were a part of scheduled rail traffic on summer weekends. It would have been way beyond our resources to replace all these trains, hauled by 017 in previous years, on a regular basis. However, we will soon run one excursion train as a recompense to all railway enthusiasts who have been vainly waiting for scheduled NOHAB services this summer, and to all those who just wished to relive the old atmosphere of summer trips to the lake. Our special train will run on August 27, on the classical Budapest  Tapolca  Keszthely  Tapolca  Budapest route. This time, our excursion is also dedicated to the memory of signal tower II of Székesfehérvár, a landmark of technical and architectural importance which has recently been demolished. While passing through Székesfehérvár station, we plan to mark the site of the tower with flowers dropped from the train. Along the north shore of Lake Balaton, we plan to stop at several locations both ways, so that those wishing to complete their summer program with a plunge in the lake, may well combine this with the train ride. June, 2016  Our excursion train of June 11 attracted much interest among railway enthusiasts. This time, our route went over recently overhauled line 2, as well as lines 4 and 1. We visited the limestone quarry siding at Doroglikely as the only passenger train to do soand bade farewell to Felsõgalla with a brief detour to the intact section of the former main line. In the past days, we received lots of positive feedback that, in addition to the impressive photos and videos, give us confidence that we gave the railway enthusiast community some more extraordinary highlights to experience and remember. Aside from the positive feedback, we are all the more grateful for the work of those whose cooperation and commitment was essential for the event. We would like to thank the management of the Railway Historic Park for making the departure and arrival possible in the area of the park; the employees of the Budapest Directorate of the Track Management Department of the State Railways for technical and administrative preparation of the trip to the Dorog quarry siding; and the employees of Baumit Kft. for permission and on-site assistance of the visit to the quarry premises. Many more employees of the State Railways who were on duty at the time of our special run contributed to the success of the excursion trainwe also thank them for their efforts. This years excursion was the very first time for us to use the passenger cars of MÁV Nosztalgia Kft. and organize the event with their collaboration. We thank the employees of the company for their commitment, and hope that this also marks the beginning of a long-term collaboration. February, 2016  Last week was exceptionally eventful and demanded much work from us, yet, in hindsight we can very well say that we wrote a bit of railway history. We have, namely, saved the demonstrator unit which had an outstanding impact on the beginnings of diesel traction in Hungary. Now, the locomotive was brought back to Hungary and awaits its restoration to operable condition. We had to struggle hard for the NOHAB demonstrator which served in Norway for more than four decades as Di3.623, and preparing and carrying out the long journey of the unit brought us just as much work and unforeseen obstacles. Many have helped usboth with work and assistance with organizing and negotiationsin our efforts returning the loco to Hungary. Most appreciated is the help and support by many people at the Swedish rail operator TÅGAB who sold us the locomotive at a very affordable price and were always helpful with the technical preparation of the locomotive for transport, as well as by negotiating with authorities on our behalf. We are also grateful for the help of employees at the railway companies participating in the transfertheir quick action was essential in overcoming several obstacles. We also thank CRS Kft. for providing brake cars of fitting appearance for the last part of the demonstrators return. Last but not least, we thank our long-time faithful supporter, Klaus Korbacher a.k.a. NOHAB-Pappilike so many times since the beginnings of our group, he supported our efforts with a generous donation. The homecoming of this technical milestone was followed by many enthusiasts and recorded in photos and videos abroad and in Hungarywe hope to care for just as much excitement with a restored and operating demonstrator not too far in the future. December, 2015  The revenue service of the Hungarian NOHABs ended in December 2000, and shortly thereafter, the home depot Tapolca had to part with the remainder of the fleet. Many were hoping for a return, as well as for the former home of the class receiving a true chance of preserving the memories of the era when these locomotives were an inseparable part of the town and the landscape. Fifteen years after the end of that era, we can now look forward to a return: within days, the preserved cab of 004, the former heritage unit derailed in 1999, will be transferred from the open-air exhibit of the Museum of Transport to Tapolca where it will be placed on display at the railway station. On this occasion, the NOHABs currently operating in Hungary will meet at Tapolca: on December 22, no fewer than seven locomotives will meet at the former home depot. Six of the machines will arrive in a special train from Budapest which is scheduled to leave from Kelenföld station in the early morning of December 22. Our locomotive received an invitation from the operator of the train, MÁV Nosztalgia Kft., which we accept gladly and join the consist of the special run. This is also the sign of a major cooperation developed during the preparation of the eventswe hope that this friendly amosphere will also shape the future of the Hungarian NOHABs and the preservation of our railway heritage. May, 2015  Our special run of May 30 over the Bakony hills received more attention among railway enthusiasts, and we could welcome more passengers on board the excursion train than on any previous occasions of this kind. It is a pleasure for us to fulfillin addition to preserving our locomotive in operational conditionanother main goal of our group, that is, running excursion trains that find more and more acknowledgement among enthusiasts and railway employees likewise. Aside from the positive feedback received so far, we would like to thank for all the help that was essential in preparing and successfully running the excursion train. Special thanks are due to András Novodonszki and Erzsébet Bereczki for preparations and assistance at MÁV-Start. Also, we thank all those whopartly behind the scenesspared no effort with advice and support for obtaining the running permits for line 11. Last, but not least, we also thank the numerous helpers whose hard work of organizing and recording the event in picture and sound contributed to making the excursion one of this year's railway highligts to remember. May, 2015  As many friends of the roundnoses may know it, the history of the Hungarian NOHABs did not begin with the delivery of the first units in 1963. It was, namely, in May 1960 that the builder sent a demonstrator to Hungary to prove the abilities of the type, by then already famous for its durability all over the continent. Before it continued its career with the Norwegian State Railways as Di3.623, the demonstrator secured itself an outstanding place in Hungarian railway history. 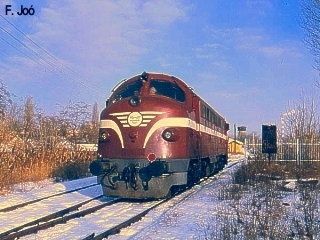 The favorable experience gained with the unitto the greater part in scheduled servicedetermined the pioneering type of mainline diesel traction at the Hungarian State Railways. Due to its unique role, the preservation of this locomotive has always been of great concern to us, therefore, we conducted negotiations with leading officials of the Norwegian State Railways in 2000 about a possible purchase of the unit. Di3.623 never was just a random locomotive to us; in fact, its preservation was so important to us that we would have preferred Di3.623 over M61-010 if the purchase of the former demonstrator were an alternative. Unfortunately, this option never materializedalong with 4 other units, Di3.623 was sold at that time to Ofotbanen, and continued its career, after the bankruptcy of the latter operator, in Sweden where we continued to closely follow the condition and operation of the locomotive. It was a year ago, on April 17, 2014, that the shocking news met us: Di3.623 suffered an electrical fire at Fagelsjö, and the damages it sustained made repairs economically unfeasible. We contacted the owner of the locomotive immediately, and did everything in our power to win the race with timeand competitors with overwhelming financial power. Despite all efforts, the locomotive remained at risk of being scrapped until the Swedish operator TÅGAB purchased the remnants to secure some of its main components. Despite the latter, this purchase saved the remnants of this technical milestone in the last minute. As many times before, TÅGAB proved to be a partner who has much understanding for our preservation effortsthis time, they helped us by selling us the locomotive in a transportable state. Beyond doubt, this is an important step in preserving railway historic heritage, however, it is also clear what tremendous challenge we chose to meet. First, the locomotive has to be hauled to Hungarythis alone will incur expenses on the order of magnitude of several ten thousand EUR. Once the return of the locomotive is accomplished, we can start with its technical restoration. While we will have a much better starting point than with M61-002, it will still take unthinkable work and expenses to repair the damages and replace missing components. We know very well that this undertaking is seriously challenging our current capacities in all regards. Nevertheless, we do hope that there will be many who will support our effortsby however humble meansand contribute to the preservation of this outstanding landmark that will, after its memorable visit in 1960, hopefully run on Hungarian rails again. April, 2015  There is yet another event to look forward to, as preparations for our next excursion train are already underway. The tentative date of the trip is Saturday, May 30we will be back with more news on our web page and in our newsletter as further details evolve. December, 2014  In 2014, domestic taxpayers have supported us with HUF 1,530,023 (ca. EUR 4,900) worth of income tax donations, in addition to the regular or occasional financial help from our supporters. We would like to thank again for all these donations, and last but not least for the countless hours of voluntary work without which our locomotive, 618 010, would not be such a reliable performer, and we could not have started the restoration of former M61-002. We hope that this year's achievements and events have again confirmed that we are worth the support so vital for our continued preservation activities. November, 2014  We are happy to announce another upcoming public appearance of our locomotivethis time as a guest performer at the Sausage Festival held at the Railway Historic Park on November 1416. The locomotive will arrive during the first day of the event, and will remain on site for the entire duration of the festival. Visiting times and movement of the locomotive will, as usual, depend on the host of the event. September, 2014  Our memorial train of September 13 was a milestone, andaccording to all the positive feedback we received in the meantimethe greatest railway event of the year for many of the participants. With the special run, we commemoratedaside from derailment victim M61-004our friends at the railroad who gave us essential support but could not live to see the return of our preserved locomotive to its former home Tapolca. Our efforts were already hampered in June in the last minutethis time, however, the commitment and help of many people got us past all obstacles, and the event could take place as planned. For all the assistance, we would like to thank again sales director György Zaránd, currently CEO of the State Railways, as well as András Novodonszki, Erzsébet Berecki, and all other employees of the sales department who helped us with words and deeds both inside and outside the directorate. For the administrative and technical preparation of the route to Zalahaláp, we owe special thanks to György Lukács, head of the regional directorate Szombathely, and Béla Fenyvesi, chief engineer at the regional track management department. We received much help in Tapolca, too, both from the municipality, and the railroaders whom we have known as best friends for many years, back to the time when Tapolca operated as a railway depot in its own right, and was home to the Hungarian NOHABs. For all the devoted help, we thank László Sörös, last supervisor of Tapolca depot; mayor László Császár and chief counselor Tamás Parapatics, as well as track attendant Imre Tóth. Above all, however, do we express our gratitude to Betti M61-019 Visiwithout her help, her local knowledge and contacts, our train could not have passed the first turnout to Zalahaláp. We are also grateful to the relatives of our late friends for their consent to the naming of our memorial train. June, 2014  We regret to announce that the preparation of our excursion train of June 14 faced obstacles that cannot be overcome in the remaining time. The current conditions of the special run do not permit us to appoint the locomotive personnel directly. Nevertheless, given the practice of past years, we could have full confidence that our train would be allocated personnel from Tapolcapeople whom we trust from the beginnings of our group or much before. It was after preliminary confirmation and public announcement of the train that our negotiating representative was informed that such allocation of personnel was not possible for our train. We feel that this is more than unworthy of a memorial train tied so closely to Tapolca, the former home depot of our locomotive. It is by now, unfortunately, clear that the problems cannot be solved in the time remaining until the date foreseen for the special run. We do our best in finding a solution acceptable to all parties involvedit means, after all, very much to us to run the memorial train, in the way and along the route originally planned. We kindly ask for your understanding and patiencewe will announce the new date of the excursion run as soon as possible. May, 2014  June 4, 2014 will mark the 15th anniversary of the derailment in which M61-004 suffered damages beyond repair. Beyond doubt, this was a sad milestone in the history of the Hungarian NOHABs, and not only because the accident crossed the plans of preserving the unit and set a premature end to all the efforts of the home depot of the class. The derailment turned more into a desperate appeal, especially in view of the events thereafter, calling attention to the hard struggle the enthusiast community, or even the home town of the class, had to master in preserving the heritage of the locomotives. The anniversary also presents itself as a special occasion for the friends of the NOHABs to gather again and look back on the 15 years that have passed, the great moments of the time beyond revenue service, as well as thesometimes hard-wonachievements of preservation. The supporters of the NOHAB-GM Foundation and locomotive personnel of the former home depot Tapolca plan to commemorate the occasion with a with a get-together at the memorial of M61-004 next to Badacsonylábdihegy. Everyone is welcome to join the event which will take place on June 4, 2014, starting 4:30 PM. The last trains to the site depart from Budapest Déli pu. at 12:35 PM, and from Tapolca at 3:40 PM. We will gather next to the memorial, or, on demand at Lila büfé opposite the railway stop Badacsonylábdihegy. Feel free to contact Ferenc Joó (+36204141621) for latest information on the event. Also commemorating the same anniversary, our foundation plans to run an excursion train to Tapolca, hauled by our locomotive 618 010, on June 14, 2014 according to preliminary plans. We are already negotiating with MÁV-Start regarding the special run, however, we will only be able to announce the trip once the railway company gives official approval. Therefore, we kindly ask for your patienceonce we know more, we will report it immediately. April, 2014  Last weekend was particularly eventful for us. Again could our locomotive visit the Railway Historic Park, this time participating in the Oldtimer Weekend event,being this time the only M61 class locomotive on site which visitors could see, climb aboard or see running. We would like to thank everyone contributing to our success, be it with the work of preparing, organizing the public appearance, or showing interest as a visitor of 010. Recently, much has been going on behind the scenes as well. As some of you may already know, we recently began regular announcement of expected service of 010, including freight runs, helper service, etc., carried out by our operating partner MTMG Zrt. From now on, latest schedule updates will be shown in a table on our Hungarian web page for recent news, while our English and German news pages feature a link pointing to the Hungarian page. In the past weeks, much of our work was devoted to the largest project of the coming years, the restoration of 002. With 002, we can give restoration a clean start as we have no spatial limitations in cleaning out the carbody and performing all necessary repairs. As of now, some sheet metal work was done (including uncovering corroded spots), and the underframe was freed of some of the oil sludge deposited over the past decades. Also in progress is the rebuilding of the steam generator cabinet on the No. 2 endwe cut back the frame and will reassemble a shorter cabinet to free up some space in the cab. Last weekend, we also welded back the ditch light casing which was cut out over ten years ago when the unit was destined for scrap. While the light casing is already in its proper place, additional bodywork is still pending to complete this restoration step. In the near future, we plan to report our progress with pictures on our website. February, 2014  The results of our photo contest of December last year are long overdue. Unfortunately, thepartly unforeseentasks of the past months demanded more than we could handle, and a number of ongoing activities had to be postponed. Our photo contest was among the latterwe apologize for the long delay. We congratulate the winners who will be contacted shortly to prepare their prizes of choice. December, 2013  In 2013, we received EUR 5500 (GBP 4600) worth of income tax donations, as well as regular or occasional donations from our supporters. We are grateful for all supportalso, last but not least, for the countless hours of voluntary work and assistance in overcoming technical and administrative obstacles. Only with all this help can we conclude the year with our locomotive in working order and licensed for operation on the domestic rail network. December, 2013  We were impressed by the endurance of the railway enthusiasts who followed our anniversary train on November 17many of them climbed rocks or spent hours waiting in the cold fog to take all those spectacular pictures and videos of our excursion train. Being the organizers in charge of the event, we had to miss many opportunities of documenting the triptherefore, we now would like to address the railway enthusiasts we have treated to some rare moments to remember. Third prize: 2 anniversary T-shirts or mugs. Winners of the contest will be contacted individually regarding their particular choice of souvenir (including size if T-shirts are preferred). Entries are accepted via e-mail to info@nohab-gm.com until December 31, 2013, with a resolution of not less than 1024×768 pixels. Winners will be announced by mid-January, 2014. November, 2013  We would like to thank everyone whose contribution or participation helped our excursion train of November 17 become one of the anniversary years highlights to remember. Also, we can announce that our locomotive continues its assignment of last week, and will serve freight duties between Gyõr and Nyergesújfalu. As the trains will run on demand, we can, at this point, not provide an expected schedulethose interested in seeing our locomotive on these duties are advised to watch the freight traffic along the route. June, 2013  We are happy to announce that our locomotive has been invited to participate in the 50-year anniversary event of the M61 class, to be held in the Railway Historic Park. We plan to take part in the event which will be open to the public on June 15 and 16. The transfer of our locomotive will most likely take place in the evening hours of June 13. However, as the movement is not being planned and managed by us, we still cannot share more accurate information about its timing. The schedule of visiting hours and on-site operation of our locomotive will also depend on the organizers, therefore, we recommend to check the webpage of the event for further update. October, 2012  It is a pleasure for us to announce our next open day which will take place on October 6, 2012, between 10 AM and 5 PM. As usual, our locomotive will be open for visitors at the site of G.Tim-Co. Kft., near the former locomotive shed of Budapest East station. More information regarding the location of the event is available on our web site. Also, if you have further questions, feel free to contact us at our e-mail address info@nohab-gm.com. All interested visitors are welcome to join our event free of charge. 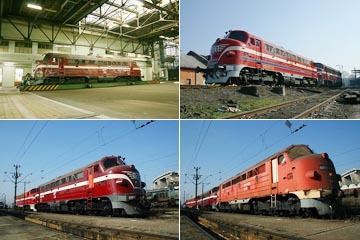 June, 2012  We are about to complete another major phase of the technical restoration of our locomotive. We have spent nearly a year and a half preparing the complete replacement of the radiator roof section with radiator cores and cooling fans, as well as partial rewiring and replacement of auxiliaries. Recently, we reached a long-awaited milestone: on June 9, we started the prime mover again, even if only for a brief test run. Very soon, a good opportunity will present itself to show the results of our work to the public: it has been finally decided that the Rolling Stock Maintenance Center Budapest East will participate in this years Museum Night event. Like last year, several rail vehicles, among them our locomotive, will be on display at the Budapest-East Passenger Car Repair Shops, from 1 PM to 10 PM on June 16, 2012. Entrance to the site is next to platform 1 of Budapest-East station. December, 2011  Our foundation has received this year's income tax donations, amounting to 2.3 million HUF (approximately EUR 7,600). We would again like to express our gratitude to all taxpayers, especially railway employees and railway enthusiasts, who supported our activities by offering 1% of their income tax to our group. We are grateful for the exceptional amount of support we keep on receiving since the beginnings of our activitieswe hope that the coming years will also prove that we are worth our supporters' donations. October, 2011  It is a pleasure for us to announce our next open day which will take place on October 29 and 30, 2011, between 10 AM and 5 PM each day. As usual, our locomotive will be open for visitors free of charge at the site of G.Tim-Co. Kft., near the former locomotive shed of Budapest East station. As far as the weather allows, we will use the occasion to present the overhauled and rebuilt roof panel housing the prime mover radiator assembly which will soon replace the current radiator group of the machine. Most of this year's activities were carried out in preparation for this significant step of technical restoration. All interested visitors are welcome to join our event free of charge. Also, we would like to mention that nearby, an oldtimer car exhibition will be open over the week-end. June, 2011  The Rolling Stock Maintenance Center Budapest East of the Hungarian State Railways has invited us to participate in this year's Long Night of Museums event with our locomotive. On June 24, 2011, from 4 PM to midnight, our locomotive will be on display at the Budapest-East Passenger Car Repair Shopsguided tours through cabs and engine room are included. Entrance to the repair shops is next to track 1 of Budapest East station. As we are not the main organizers of the event, we may not be able to answer all questions regarding access and schedule. Therefore, we suggest to contact the organizers at the address muzeumok_ejszakaja_Keleti@mav-gepeszet.hu for further questions regarding the event. All interested visitors are welcome to join the event and see our locomotive. December, 2010  Although much later than usual, our foundation has at last received this year's income tax donations, amounting to HUF 3,141,483 (approximately EUR 11,500). We would again like to express our gratitude to all taxpayers, especially railway employees and railway enthusiasts, who supported our activities by offering 1% of their income tax to our group. We are grateful for the exceptional amount of support we keep on receiving since the beginnings of our activitieswe hope that the coming years will also prove that we are worth our supporters' donations. 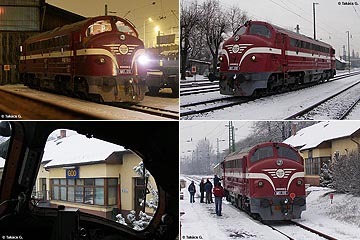 December, 2010  A whole decade has passed since the end of the regular service of the Hungarian NOHABs. Organized by locomotive engineer István Tamás Kiss, the former chairman of our group, Ferenc Joó, and the Batsányi Center of Culture, an exhibition will commemorate the event. Titled Sic Transit Gloria Mundi, the exhibit will present pictures and documents recalling the service years of the locomotives. The opening ceremony will take place on December 21st at 11 AM in the Batsányi Center of Culture (VOKE Batsányi Mûvelõdési Központ, Tapolca, Vasút út 3.) and will include the presentation of a new NOHAB-related book published by Indóház Kiadó. The exhibition will be open on work days until the end of January, 2011. October 2, 2010  Today, our locomotive was on display at the motive power show in Békéscsaba. We have not planned our participation as our current labor capacities would not have permitted the proper preparations, and timely notification of our supporters would not have been possible. This year's visit to Békéscsaba was entirely carried out by the operator of our locomotive, the Carpathian Railway, who failed to notify us of the planned participation in due time, and arranged the trip despite our explicit disapproval. We sincerely apologize to all of our supporters and railway enthusiasts who missed the event without timely announcement. September 1, 2010  The schedule of our excursion train is now finalized. Please see this page for further information. August 23, 2010  The efforts of almost ten years are finally yielding their fruits. Now, we are proud to announce that we will soon reach our next important milestone, and run our first excursion train during a special open day on September 4, 2010. Please see this page for further information. 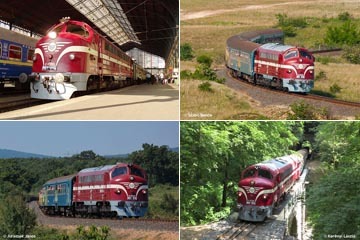 June 14, 2010  Our locomotive will perform on a shorter duty again: on Tuesday, June 15, the machine will head light-engine for Dunakeszi to return with a car to Budapest. According to plan, the locomotive is to leave the shed at Budapest-East around 10 AM; however, actual movement will depend on the current traffic load and is, therefore, difficult to be predicted. It is expected that several similar runs will take place in the weeks to come. We do not wish to announce these in our newsletter one by one, therefore, we recommend to check this news page regularly for upcoming duties. We would like to ask for your understanding regarding the late announcement of these runsnot even we are in the position of reporting them earlier, as plans for these duties are (and will be) finalized directly before they take place. June 2010  Not even a week has passed since the light-engine run of last Saturday; now, we are happy to announce yet another upcoming assignment of our locomotive. On Wednesday, June 9, 2010, M61-010 will appear on a short freight assignment: the machine will leave the locomotive shed of Budapest-East around 11 AM to receive fuel at Ferencváros, and will the head over Gyõr to Körmend to pick up a smaller freight consist, most probably by the early afternoon. We apologize for announcing the run only a day in advance - this assignment was planned to take place much later but had to be rescheduled in the last minute due to circumstances beyond our control. 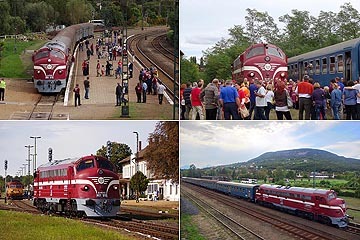 May 2010  We are happy to announce an upcoming minor trip of our locomotive to the station Kõbánya-Hízlaló on June 5, 2010. The locomotive is expected to arrive around 10 AM and will remain there for 12 hours, depending on traffic conditions. To our knowledge, this is the first occasion of a NOHAB locomotive visiting that station, and in view of the plans to abandon the line, it is likely to remain the only such event. While the track conditions limit our possibilities, we will do what is technically possible to make this a spectacular event worth remembering. January 2010  It is a pleasure for us to announce the successful test run of our locomotive, former M61-010, which took place on January 19, 2010. We would like to thank again all our supporters whose contribution made it possible that a decade of hard work led up to this remarkable achievement. Also, we hope to remain worthy of further support in the years to come, the more so as obtaining the running license is only one milestone on the way to the ultimate goal of full technical restoration and preservation of the locomotive. December 2009  Our foundation recently received this year's income tax donations amounting to HUF 3,339,578 (ca. EUR 12,250). We would again like to express our gratitude to all taxpayers, especially railway employees and railway enthusiasts, who supported our activities by offering 1% of their income tax to our group. October 2008  The locomotive of our foundation, former M61-010, completed its first test run 45 years ago. Commemorating this event, an open day of our group will take place on November 15, 2008. The event begins at 10 AM in the meeting hall of the Budapest Local Directorate of the Hungarian State Railways (3 Kerepesi út, Budapest), where latest major steps of the technical restoration of our locomotive will be explained in presentations. The meeting room can be accessed through the main entrance, upon registration at the reception. Hereafter, the machine itself can be visited between 12 PM and 6 PM at the site of G.Tim-Co. Kft., near the former locomotive shed of Budapest East station. February 2008  Another important phase in the technical restoration of our locomotive, former M61-010, is now completed: on February 20, 2008, the machine could finally leave the Budapest-North repair shops and return to its storage place in the locomotive shed of Budapest East station. Hereby, we would again like to express our gratitude to the employees of the repair shops for supporting our efforts with their thorough work. Also, we shall thank the traction manager and locomotive crew of former M61-017 for the quick transfer of our machine which was, thanks to the participation of 017, an aesthetical highlight for the enthusiast community. December 2007  Much time has passed since the latest news about our activities. One of the most important achievements of the past months is the establishment of the new board of trustees of our foundation which has been, by now, officially registered by the authorities as well. The new chairman of the board is Csaba Szabó, further members are Márton Visi and István Deák. We would like to thank them for supporting us with this work. Also, we are grateful for the tireless work of our former chairman, Ferenc Joó, who made a remarkable contribution to our success, as well as our numerous international contacts. In the meantime, our foundation has received this year's income tax donations which amount to an unprecedented sum of HUF 3,607,839 (about EUR 14,200), surpassing those of any previous year. We will spend this contribution on recently completed or planned repairs, as well as further replenishment of our spare part supplies. We shall express our gratitude to all contributing domestic taxpayers, especially railroad employees and railway enthusiasts, and hope to receive similar attention next year when it is time to donate 1% of the income tax again. The technical restoration of our locomotive, former M61-010, will soon arrive at an important stage. In January next year, the last major repair to be completed in the Budapest-North repair shops will begin: the gap adjustment of the sliding supports next to the bogie pivots. Upon completion of the latter, the locomotive can leave the repair shops again and return to its home base at the locomotive shed of Budapest-East station. Once this is accomplished, we will update the online description of the technical restoration, and somewhat later, we will present the locomotive to the public at an open day. We hope that this report was good news for you. We wish you all a merry and blessed Christmas and a happy and successful New Year. November 2006  This year, our foundation received HUF 2,776,033 (about EUR 10,800) from personal income tax donations (the tax authorities may transfer further additions to this amount in the next few months). We would like to thank every Hungarian taxpayer, especially those employed on the railways, who supported us by offering 1% of their income tax to the NOHAB-GM Foundation. We will publish more details about the intended use of this amount as soon as advances in the technical restoration of former M61-010 allow us to set up more accurate plans. January 2006  We report with deepest grief that our friend and member of the board of trustees of the NOHAB-GM Foundation, Mr. János Previcz, departed on January 7, 2006, after enduring a long illness. He had been taking part in our activities, especially in the technical restoration of our locomotive, since the initial years, and his passing away is a painful loss for our foundation, as well as for all friends of NOHAB locomotives. We shall keep our memories of János forever. November 2005  In late October 2005, our foundation received HUF 2,505,812 (EUR 10,023) from personal income tax donations. This will cover ongoing repairs which are vital for the restoration of our locomotive into serviceable condition. We hope that the above will also facilitate the purchase of further spare parts. We would like to thank every Hungarian taxpayer who supported us by means of offering 1% of their income tax to the NOHAB-GM Foundation, especially those employed on the railways. June 2005  The technical restoration of the locomotive of our foundation, former M61-010, passed another important milestone: on 21 June, 2005, the machine was hauled to MÁV's Északi (Northern) Repair Shops where, aside from other lesser work, wheel tires will be changed and bogies will be inspected and repaired. The repair shops support our foundation by performing the tire change and associated technological steps free of charge. Further progress of the restoration process will be reported later. March 2005  It is a pleasure to announce that  after years of almost hopeless waiting  our foundation is about to purchase the empty carbody of M61-002. The remnants of the locomotive were offered for sale through an auction which we have won by submitting a bid of HUF 2,625,003 (cca. EUR 10,800). Though this purchase price is doubtless to be a financial burden for us, we unanimously decided to save the last Hungarian NOHAB with unclear future from the cutting torch. Hereby, we kindly ask all our supporters to give us, if possible, additional financial help to realize this preservation effort. Handing over the locomotive went quicker than expected: M61-002 was transferred to the fomer locomotive shed of Budapest East Station already on March 3, 2005. On January 22, 2005, our next open day will take place. In the first part of the event, from 10:00 AM to 1:30 PM, the locomotive  with its prime mover working  can be visited at the site of G. Tim-Co. Ltd. (at the former locomotive shed of Budapest East Station). In the second part of the meeting, beginning at 2:00 PM, a conference room of the nearby Hotel Stadion will host presentations on the first five years of our foundation and last year's journey to Denmark, followed by excerpts from a new episode of András Novák's video series NOHAB's at the Turn of the Millennium. December 12, 2004  Upon completion of the most necessary repairs, the prime mover of our locomotive was started again (see pictures). After the long-awaited restart (sound files here: 1,2) the locomotive returned to the shed under its own power. On this occasion, we would like to thank again all the support without which the locomotive's restoration could not have advanced to this point. Also, we would like to publish an announcement of András Novák, author of the DVD series NOHABs at the Turn of the Millennium, also sold at the GM-meeting of Odense. October 2004  Our foundation received HUF 1,748,663 from income tax donations which will in part cover the costs of wheel tire replacements and bogie repairs. We would like to thank everyone supporting us with 1% of the income tax. We especially appreciate the help of every supporter employed at the railroad. Also, a trip report about the journey of 2761 017-9 (former M61-017) to Denmark is done at last and can be read here. August 2004  Locomotive 2761 017-9 of MÁV PMLI Center of Technology, former M61-017, is about to participate on the international meeting of GM locomotives held in Odense, Denmark, on 1415 August to commemorate the 50th anniversary of the MY class of locomotives at DSB. The visit, organized by our foundation, will be financed by Danmarks Jernbanemuseumm and one of our key private supporters, Klaus Korbacher. As, until very recently, several circumstances were endangering the entire trip, it is only now that we can announce the envisaged participation of the locomotive. The machine, accompanied by a staff car, is planned to depart from Budapest on August 10, around 10 PM, will pass the border to Austria at Hegyeshalom at around 5 AM on August 11, and will reach Denmark over the route Salzburg  Koblenz  Niebüll  Tønder. On the way back, a halt for a publicity show is planned at Niebüll, and another longer stay will occur at Koblenz. According to the current plans, the special run will return to Hungary on August 19. Please watch this page for recent news. July 2004  We have purchased used prime mover parts and electric components from a foreign partner. Depending on time available, we will begin with the renewal of the parts in the near future. June 2004  To commemorate the derailment of M61-004 in an accident five years ago, on the 4th June, 1999, our foundation erected a memorial column not far from the former derailment site. We would like to express our thanks to Mr. Péter Vollmut, mayor of Badacsonytördemic for his help in setting up the monument, and to Mr. István Kocsis (Cegléd, Multi-Essence Ltd.) for providing the memorial plaque. We shall also thank the Balaton Uplands National Park and the Szombathely division of MÁV PMLI Ltd. for the building permit and for securing the building site. Due to the very limited space between the track and road 71, the inaguration of the memorial column could only be held in presence of a few selected visitors, among them locomotive engineers form the former M61 depot Tapolca, and one of our chief supporters from Germany. MayJune 2004  The prime mover is getting ready for restarting. Prior to this, however, further repairs were to be carried out. See this link for further details. February 2004  We have set up a new page on the progress of the technical restoration of our locomotive. Also, the links page has been further enhanced. January 2004  The new wheel tires have been delivered to us; now, we are arranging the change of the tires. On November 15, 2003, a special open day took place, commemorating the 40th anniversary of our locomotive having entered service. Click here for further details. October 2003  Our foundation received HUF 1,213,149 from income tax donations which will be spent on purchasing lubricating oil and wheel tires. We would like to thank everyone supporting us with 1% of the income tax. We especially appreciate the help of every supporter employed at the railroad. September 2003  In the last months, we have performed several important repairs on our locomotive, many of which are required for restarting the prime mover. Click here for further details. In January 2003, we have set up a picture gallery. As for now, only European EMD cabs are included, but depending on available material, also cab units of other continents will follow. On January 25, another open day of our foundation will take place. From 10:00 AM to 3:00 PM, larger groups can visit our locomotive with our guidance. Please call (+36 30) 954 6665 if interested. On November 2, 2002 an open day of our foundation will take place. From 2:00 PM to 6:00 PM, larger groups can visit our locomotive with our guidance. Please call (+36 30) 954 6665 if interested. March 5, 2002  Our foundation paid the last installment of M61-010's sale price; thus the ownership of the locomotive has been finally transferred to us. Again, we would like to thank all our supporters, without whose contribution the locomotive could not have been saved. December 2001  M61-010 is here at last! The locomotive purchased by our foundation was transferred to its new storage place on December 21st, 2001 at 10:30 AM. The first technical inspection found no major damages, except for the batteries which were in a heavily worn state. Further inspection and repairs will be carried out next year. We will give further information about storage and accessibility of the machine as soon as possible. November 2001  On Nov. 28th 2001, the contract between MÁV and the NOHAB-GM Foundation was finally signed. According to the contract, the State Railways will sell M61-010 to our foundation for HUF 8,125,000. More news is expected to come in the next few weeks; we will report it in detail. June 2001  Our price offer submitted for the acquisition of M61-010 was considered the best by MÁV, thus we are currently negotiating about the details of the contract of purchase. We hope to report the transfer of the machine to our foundation in the near future. March 2001  MÁV's auction plans have failed on the 6th of this month; not a single offer has been made for the acquisition of an M61. As a consequence, MÁV has announced to accept reduced price offers; therefore, our foundation has restarted negotiations. We hope to inform you of further results in the near future. February 2001  MÁV has announced an auction of four M61's, which will be carried out on March 6, 2001. With the conditions set, MÁV has succeeded in excluding our Foundation from the auction. 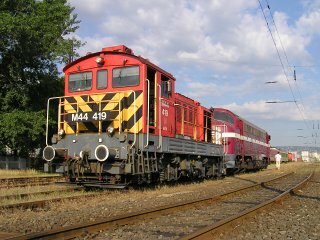 It is speculated that MÁV will proceed with the usual scenario  if the locomotives cannot be sold, they will be scrapped to prevent others from owning an M61 in Hungary. December 2000  All M61's of the MÁV will be withdrawn and the units remaining at Tapolca (M61-006, 010, 019, 020) are to be transferred to Budapest on 22nd December 2000. The last run with a passenger train is expected to be on 21st Dec., with M61-020. Almost simultaneously, regular Di3 service in Norway will end on the 27th December; final withdrawal will be on 7th January, 2001. 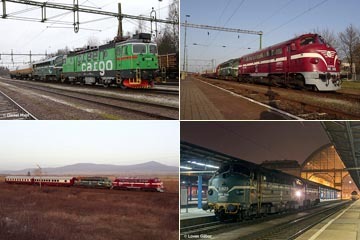 Four units are destined for service in Kosovo (Di3.619, 633, 641, 643) while Di3.622, 626 and 630 will be sold to Italy. Currently, MÁV intends to sell the remaining M61's. No plans of cutting up further units are known, although M61-002 is now used as a spare parts supply for the Nostalgia machine M61-001. We keep in contact with MÁV concerning the purchase of one unit. Recently, we have also established contact to foreign railroads and had some preliminary negotiations concerning possible purchase plans.